Courtney was born and raised in Tucson Arizona. Before starting CrossFit, Courtney had never competed in sports. She worked out and did some yoga as well, but never worked too hard when it came to physical and nutritional endeavors. Her life changed forever when she found CrossFit. 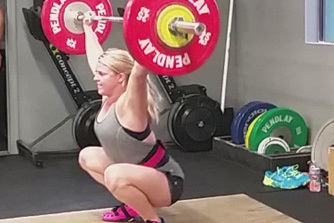 She began taking CrossFit classes at 646 and found that she picked up the movements very well, even though she couldn’t back squat the 45 pound bar in the beginning. She took a liking to the Olympic lifts and after some training, she did her first weightlifting competition in 2015 where she went 6 for 6. Since then, Courtney has won a few local competitions and even competed at the 2016 University National Championships! Even though her qualifying total was ranked 38th in the 63 kg weight class, Courtney exceeded expectations by finishing 7th at University Nationals and 5th for the Under 25 National Championships and her total of 165kg qualified her for the 2016 American Open! Courtney is looking forward to helping other people meet their fitness and health goals as she has done. Courtney truly is living proof that every person can meet their goals with consistency, determination and a little fun! In addition to coaching, and working out every day, Courtney is also a full time Nurse in Tucson.